Save A Life Group is a 501(c)(3) non-profit organization that was formed with the goal of SAVING more PATIENTS on the organ "waiting list". Creating more awareness about organ, eye, and tissue donation and transplantation, through events and educational sessions in order to increase the donor registry is our MISSION. Following a liver transplant in January 2013 that saved Gary Simmons' life, he did much research on organ donation and transplantation and learned that there are many myths regarding donation that are preventing people from saying "yes" when asked the question at their local DMV, "Would you like to be an organ donor?" Given a consistent annual statistic that over 123,000 people are on the waiting list, and that only about 20% will become recipients, many are dying. While approximately 90% of adults feel it is a very charitable act, national statistics reveal that on the average only about 45% nationwide are registered. While North Carolina is at about 53% and 6th in the nation, still with approximately 50% not registered, we have a problem and can do much better. One donor can save eight patients and improve the lives of 50+ others. Gary realized he had been "blessed", and wanted to do something to help "pay it forward", along with the other team organ recipients. So with the help from fellow organ recipients, church members, sponsors and advocates, combined with some "seed" money from Carolina Healthcare Foundation, Save A Life Group was founded. 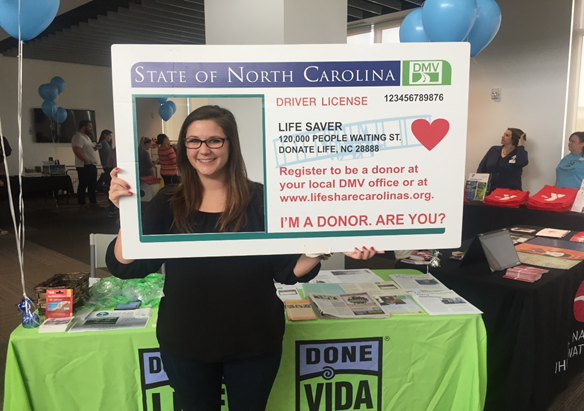 While the direct beneficiary is the "patient on the waiting list", funds received have been donated to LifeShare Of The Carolinas, the organ procurement organization in this region, whose goal is the same as SALG. For more information, please call Gary at 704-699-3046, or e-mail at 1garysimmons1@bellsouth.net.